Sandy improves everyday. 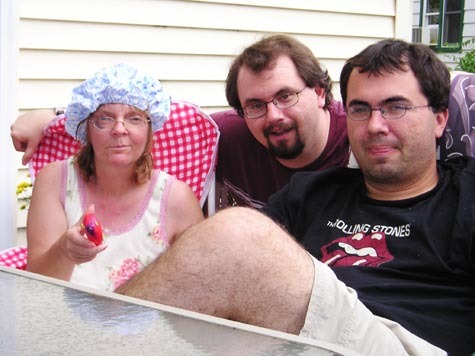 Here she is having fun posing in her new shower cap with her stepsons, Paul and Steven, and yes, she gave me permission to post this photo. Sandy only had to wear it two times. Doctor White's office called and said she could now shampoo her hair. The red object Sandy is holding in her right hand is a fish squirt gun that her sister Lori gave her. She likes to let me have it when I am not looking. Doctor Bastin's office called and set up an appointment for next Monday, August 1, for Sandy. She will be fitted with a hood and have a simulation done then her radiation and chemo should start the next day and last for six weeks. The hood protects the part of the brain that does not receive the radiation. I do not understand what a simulation means but will post a more meaningful description after it is over next Monday. Yesterday, Sandy and I went for a short walk down the street about three blocks and back. It tired her a little and she took a short nap in the afternoon. 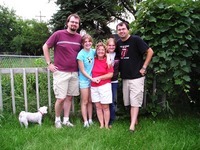 The photo below is a snap taken in front of Sandy's garden with our dog, Charlie Brown, Paul, Erin, Breanna, and Steven.